WEST LAFAYETTE – Purdue spent the summer and early fall deciding between Elijah Sindelar and David Blough at quarterback. Sindelar won the competition and started the season-opener against Northwestern on Thursday. By the end of the first half, Blough was in. In between, Sindelar tossed three interceptions, including two in his own territory, and Northwestern scored touchdowns off of all three, propelling the Wildcats to a 31-27 victory at Ross-Ade Stadium in front of an announced crowd of 47,410 despite a record-setting game from Purdue freshman Rondale Moore. Northwestern held the ball for the final 7:57 of the game, to stymie Purdue's chances to come back in the fourth quarter. Northwestern led 31-17 at halftime and Blough led his team back in the second half. A 45-yard run from DJ Knox set up a touchdown on Purdue's first drive of the second stanza to cut the deficit in half. The next time the Boilermakers got the ball, they marched 76 yards on 14 plays, wiping 6:46 off the clock. 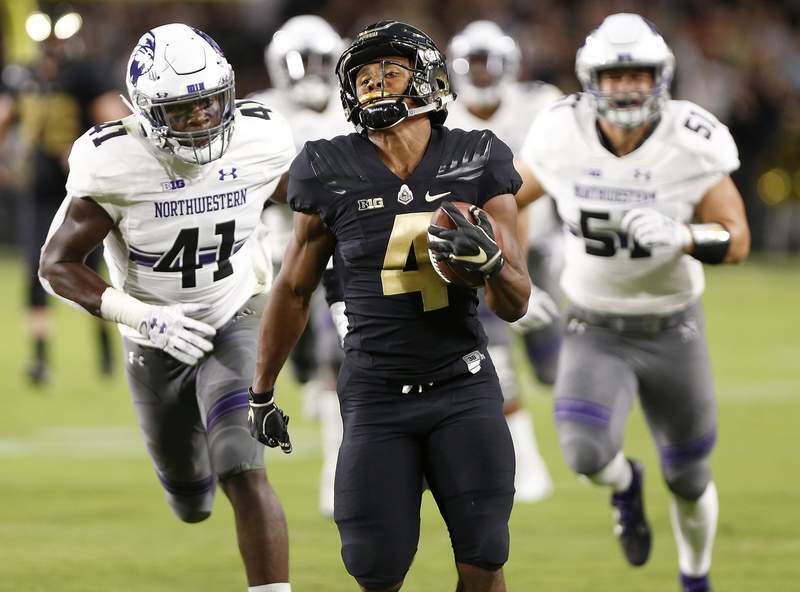 The threat of Blough scrambling opened holes for the Purdue running game and the quarterback kept it himself several times for solid gains, but the drive ultimately ended in a field goal and Purdue's best chance to draw even came up short. The victory was Northwestern's ninth in a row, extending the longest active winning streak among Power Five conference teams. For Purdue, the loss snapped a string of 14 straight years in which it had won its home opener. The Boilermakers have lost twice in their last six games dating back to last season and both losses have come to the Wildcats. Northwestern's 21 points off turnovers in the first half made a major difference, as Purdue out-gained the Wildcats 472-401. Sindelar made several big throws and finished with 196 yards in the first half, but his interceptions held Northwestern build a solid lead. Moore, a true freshman playing his first college game, was the contest's breakout star, gaining 188 yards rushing and receiving and adding 125 on kickoff returns to give him 313 all-purpose yards, breaking a Purdue record that had stood at 312 since 1972. The Louisville native also scored two touchdowns in the first half, one on a 32-yard reception off a crossing route and the other a 76-yard rush on a jet sweep, the longest run by a Purdue player since 2014. Moore, the top recruit in Purdue's 2018 class, was bottled up in the second half, but was clearly one of the best players on the field in either uniform.